The search for ‘truest’ or ‘purest’ colour has been a story of revelations. Some of the purest forms of colours have been available in nature, as flowers, body colours or spots over insects and birds. These were sought in applicable forms such as pigments and juices or dyes. It was realized from very primitive times that both the forms have distinctive applications. Pigments are good for wall-arts and juices or dyes are good for body colouring, fibres and leathers. Beyond this it was also known that pigments were comparatively opaque in comparison to nearly transparent juices or dyes. Primitive age craftspeople had typical understanding that very ‘pure colours shades’ were less lasting than slightly compromised shades. This realization was due to the fact that oxide and natural pigments were longer lasting or non-fading. A ‘richer’ shade of colour was sought by methods of purification or concentration through separation, grinding, washing, floatation, sieving, calcination or sintering. Centre Le Corbusier, Zurich Wikipedia image by Author Absinthe. Since prehistoric period it was also clearly known that richness of the colour lies in the contrast it creates with the nearby colour. Such an understanding of colour value is known only to the actual user of the colour and not to lay persons who can philosophize the effect. Realizations are not necessarily visual percepts. Through such attempts of definition first theories of colours began to emerge. Greek philosopher Aristotle related colours (as maintained in De colouribus) to the four elements: air, water, earth and fire. But then he was not a visual art practitioner. “For air and water are naturally white in themselves, while fire and the sun are golden. The earth is also naturally white, but seems coloured because it is dyed. This becomes clear when we consider ashes; for they become white when the moisture which caused their dyeing is burned out of them; but not completely so, for they are also dyed by smoke, which is black. In the same way sand becomes golden, because the fiery red and black tints the water. The colour black belongs to the elements of things while they are undergoing a transformation of their nature”. -Aristotle’s realizations of colours. Since Aristotle’s time such ‘subjective realizations’ have found little favour with the art painters. Their triad of colours was of Red-Yellow-Blue of pure colours or un-creatable shades. But for many years, black and white remained baffling ‘colours’. One could mix few colours to match a ‘near-black’, but the same was not possible for white or ‘near-white’. The ‘disappearance of colours’ on a flying wheel and perception a white was not yet logically connected to this perplexity. It had to wait for Newton to explain it. Many painters before 1600s have written about creating and using colours, their ability to consistently reformat the same colour and also their inability to reformat the same shade in spite of all care and documented formulations. Describing a colour was even harder than creating it. The writings fail on how to state a colour shade. Colours have had only metaphoric interpretations. The Red-Yellow-Blue colour triad was the painters’ logic of defining the colours as per the visual experience. Franciscus Aguilonius (1567-1617) a physicist disputed Aristotle’s theory or rather the philosophy of colours. He devised a better method of identifying and arranging the colours. 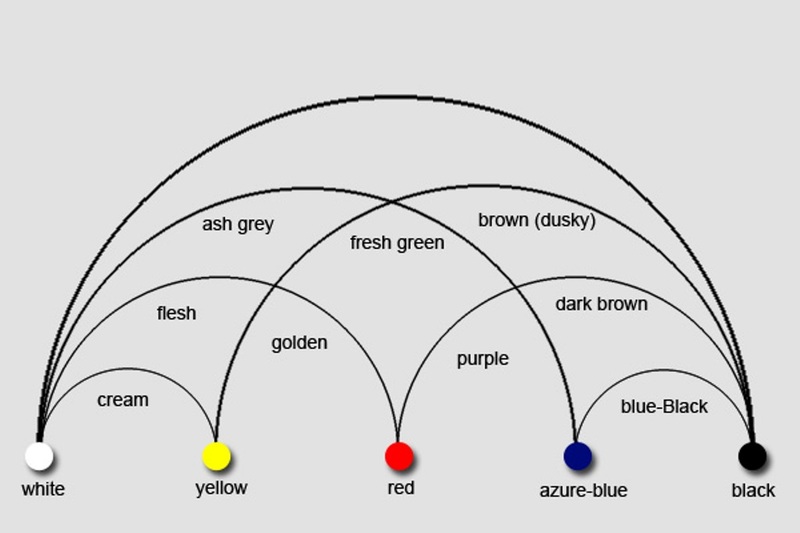 Colour arrangement was of placing 5 colours White – Yellow – Red – Blue – Black, at the bottom, and mixes of these forming the riser. He included the Red, Yellow and Blue which became the forerunner of other systems that function in a similar way. This was a chart, and not a colour wheel. Aron Sigfrid Forsius (1611), a Finnish born astrologer, priest and neo-Platonist, and contemporary of Franciscus Aguilonius, derived a drawn colour arrangement with five main colours: Red, Yellow, Green, Blue and Grey, all placed for their affinity to Black or White. This, however, was going to change some 60 years later. In 1672, Newton showed the optical quality of colours, as a spectrum of seven colours. This was very different from earlier attempts of visual gradations of colours. This interpretation was challenged, by Goethe in the ‘Theory of Colours’ (1810). For him it was important to understand the human reaction to colour, compared with Newton’s science supported explanation. But at that time there were few takers for it. Newton first divided the spectrum in five main colours red, yellow, green, blue and violet but later included orange and indigo, to analogize with the seven notes in a musical scale, and perhaps the solar system, and days of the week. Richard Waller in Stockholm published a list of 119 colours arranged from ‘dark to light shades’ in seven columns each topping with a basic colour. 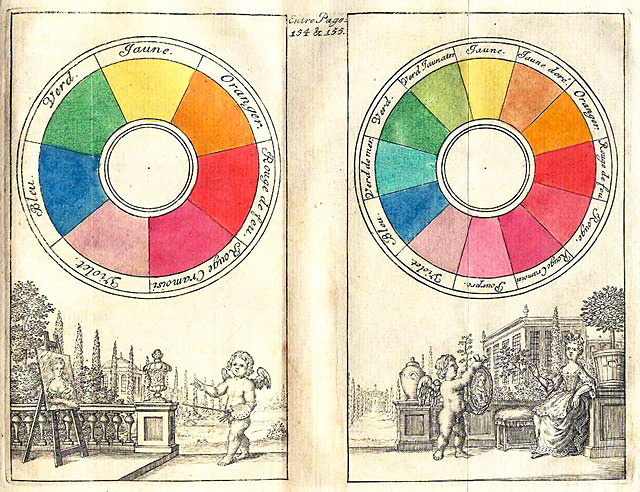 Jacob Christian Schäffer a German a natural historian and inventor wanted some standard format (Table of physiological colours, mixed and Simple, in 1686) that would permit unambiguous descriptions of the colours of natural bodies. This was the beginning of naming, identifying and graphically specifying the colours.